County Court 14th April 1856 before Mr Serjeant Miller. There were a number of cases of minor importance. 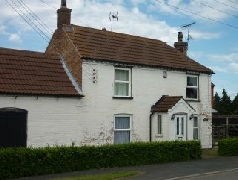 In the case of Guyley and Ross where complainant claimed £58, it appeared that ___ Guyley occupied a cottage and some lands at Hough, and owing to certain circumstances he was induced to take Ross in with him as joint tenant, the latter, according to Guyley’s statement, to have the management of the property, and to feed and clothe complainant and allow him £5 a year for pocket-money, and pay his debts. Complainant had lived with defendant five years and owing to some disagreement had left. Among the debts owing was £50 to Guyley’s brother; the brother , when Ross told him of the above arrangement to feed and clothe his brother and give him £5 a year, agreed to sink half the £50 if he acted up to it. As he had not done so the claim was 5 years at £5 = £25. Half the debt owing to Mr Thos. Guyley £25. And balance of amount of valuation £8 / £58. The defence was to the effect that Ross agreed to feed and clothe complainant, or to feed him and give him £5 a year, for clothes or pocket-money __ That it was Mr Guyley’s own act to sink the £25 upon these terms, and that the amount of the inventory had been paid above six years ago. The judge said that there was a formal receipt signed by complainant for valuation and that debts owing by complainant since, paid by Ross, more than covered the £25; and with regard to the £5 a year, though a very natural arrangement for pocket money __ yet he could not overlook the fact that five years had passed without an application for this pocket money; and under these circumstances he considered that complainant had failed to establish his claim. Verdict for defendant, Mr Healey for complainant, Mr Malin defended. William Henry, born 1853 in Brandon. By 1861 George & Ann were farming 45 acres in Brandon, but by 1871 they had moved to Fenton where they farmed 65 acres (180 acres in 1881). Ann died in 1885 aged 68 and is buried at Stubton. 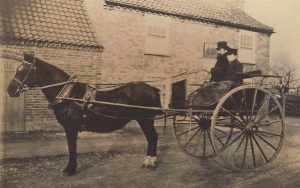 In 1891 George senior and William Henry were at Moor Farm, Stubton. George died 1897 and is also buried at Stubton. 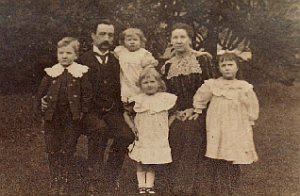 The eldest son George Ross (b 1845) continued to live in Brandon, farming 36 acres until moving to Coddington (Nottinghamshire) following his marriage to Sophia Allen (born Harrowby) in 1873. 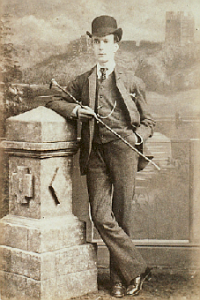 Benjamin Ross (b 1850) moved with his parents to Fenton before marrying Jane Elizabeth Marshall in 1879 and moving to her home town of Bawtry, Yorkshire. They too moved to Claypole around 1890. Benjamin died in 1922 and Jane in 1947. 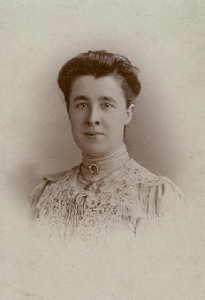 Emma Mary Ross (b 1875) was born in Brandon and moved with her parents to Fenton and Stubton. In 1896 she married Thomas Metcalfe (born near Richmond, Yorks). The first of their 7 children was born in Leeds, thereafter they lived in Saltburn by the Sea, Yorks. 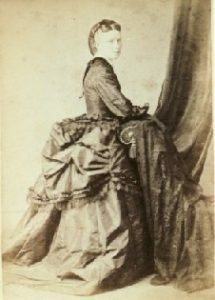 Emma Mary died in 1951. John Dexter (Jack) Ross (b 1879) was born in Fenton and moved with his parents to Stubton and then Claypole. In 1901 he was working for his father on the Claypole farm. In 1910 he married Mary Oldershaw from Stapleford, Notts. Ethel Ross (b 1881) left home by the time she was 20 to work as a housemaid in a suburb of Leeds (Chapel Allerton). Fifteen years later (1916) she married Henry Edgar Johnson (born Bardsey, near Leeds). The only child we have on record (Gertrude) was born in 1919 but died in Wakefield the same year. 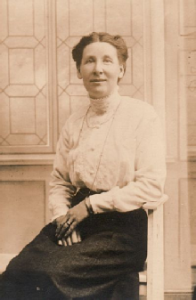 In 1901, aged 18, Sarah Ross (b 1882) was working as a nurse and domestic house maid in Winthorpe. In 1908 she married Alfred Daubney (born Haydor, Lincs) and they settled in Swarby then Horbling. Sarah died in 1954. Their first 2 daughters died in infancy their son Donald died in 1939 whilst serving the Royal Engineers and is buried at Horbling. Their youngest daughter died in Brant Broughton in 2004. William Darby Ross (b 1885) died at Newark Hospital in 1940, aged 55. Elizabeth Ross (b 1886) married George Tustin in 1909 and moved to Bassingham, where he’d been born. Elizabeth died in 1974. Albert Mills Ross (b 1888) married Ann Smith. They had 4 children (John Cecil, Ethel Mary, Albert Edgar and Pamela May) but we don’t have many other details for Albert and Ann, except that when William died in 1940, Albert was a herdsman. They may well have stayed in Claypole as they are both buried there. The youngest son, Cecil Ross (b 1891) was born at Gorse Farm, Stubton in 1891 and was with them in Oster Fen Lane, Claypole in 1901. In 1911 he was working as a grocer’s assistant in Uppingham, but when Britain declared war at 11pm on 4th August 1914 Cecil Ross was already serving as a private in 1st Battalion, Lincolnshire Regiment. Ten days later, during the Battle of Mons, the 1st Lincolns were fighting a rearguard action at Framieres (Belgium) against advancing Germans. Private Ross was reported as wounded in this action, but was later listed as killed (age 23). Ross is commemorated on the memorial at La Ferte-Sous-Jouarre, on the south bank of the River Marne, east of Paris. This village was along the Division’s line of retreat, in the area where the First Battle of the Marne was fought 2 weeks later. The memorial commemorates nearly 4,000 officers and men of the British Expeditionary Force who died at Mons, Le Cateau and the Aisne in August, September and the early October 1914 and who have no known grave. 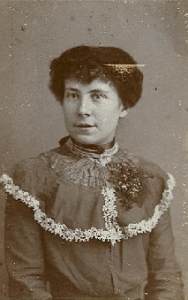 Edith Anne Ross (b 1883) married Joseph Matthew Lilley in 1908. She died in 1955 and is buried at Stubton. George Henry Ross (b 1885) seems to have taken over Moor Farm when his parents died, but he died himself in 1918, age 34 and is buried at Stubton. The last record we have for Nellie Ross (b 1889) is 1901, when she was 12 and living with her parents at Moor Farm. Minnie Ross (b 1891) married Thomas Wright in 1914. They had daughters Eileen,(1916) and Minnie (1917). Walter Ross (b 1893) – we have no more details. At the start of World War One, William Younger Ross (b 1896) was working as shepherd on Moor Farm, which was run by his brother George Henry. William joined 11th Battalion, Lincolnshire Regiment on16 Jun 1916. He was aged 20yrs, 327 days, single. 5Ft 3”,102lb. On 30th Jul 1916 he was at Usworth Camp, Sunderland. He served 215 days in the Army, around Durham and Newcastle before being discharged to the reserves on 16 Jan 1917 to return to agriculture. He was transferred to 82nd Reserve Battalion (48243) on 2 Jan 1918, whilst ‘still working on my brother’s farm, able to do light duties’. He was finally discharged from the Army on 27 Aug 1918 (his brother,George Henry, died on 2 Dec 1918). Elsie, Ross (b 1898) – last record we have is at Moor Farm in 1901, aged 3. Ernest Alvah Ross (b 1900) – we have no details beyond 1901, except that he died in the Grantham area in 1965.